On a hot summer afternoon, what could be better than a family trip out for ice cream? Here at Barstow’s, we are very proud to serve up a local, premium scoop of homemade ice cream. But it isn’t made at Barstow’s Dairy Store and Bakery. We’ve got our hands full between the cows, the crops, and the restaurant! Our ice cream comes from Maple Valley Creamery, a small farm in Hadley, MA. Maple Valley Creamery was established by farmers who believe that quality dairy products should be made using fresh milk from local cows – and we couldn’t agree with their mission more! By purchasing their products you are helping to sustain open spaces, local farms and a time honored way of life. 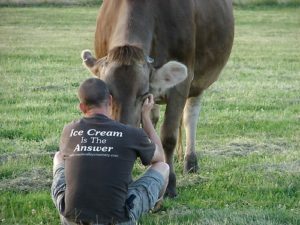 Barstow’s sells Maple Valley Creamery Ice Cream by the pint or by the cone! Our flavors change with the seasons!